EconWeekly: Income mobility in the U.S.
Income mobility in the U.S.
Five weeks ago the Wall Street Journal (WSJ) commented on a study (pdf) by the Treasury Department on the income mobility of American families. The newspaper proudly reported that 58 percent of households who were in the lowest quintile (the poorest 20 percent) of the income distribution in 1996 had moved to a higher income category by 2005. Almost 25 percent jumped into the middle or upper-middle income groups, and 5.3 percent made it all the way to the highest quintile. (See Table 1.) Of those in the second lowest quintile, almost 50 percent moved up and 17 percent moved down. The WSJ’s comment on table 1 stopped there. The evidence was described as "a stunning show of income mobility." 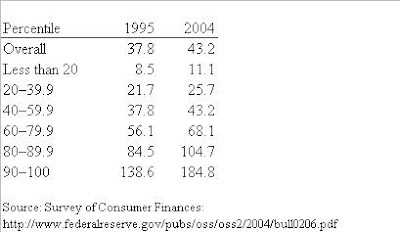 Note: an entry in the table is the percentage of households that move from the row quintile (1996) to the column quintile (2005). Examples: 28.6 percent of households that were in the lowest quintile in 1996 had moved to the second quintile in 2005; 50 (26.7+15.1+7.9) percent of households in the second quintile moved to a higher quintile. Let’s look a bit longer at this cup of water, and then decide whether it’s half full or half empty. First of all, look at how “thick” the NW-SE diagonal of that table is. The poorest households have a 42 percent chance of staying in their original group; no other group displays such a degree of immobility, except the very richest. In the second richest group, 70 percent of households stay put or move up; 69 percent of households in the top group stays on top. 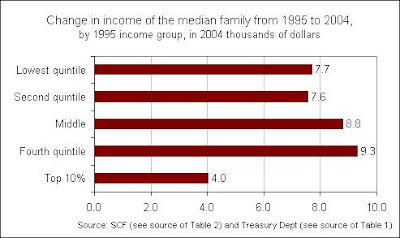 The WSJ also presented a graph with the increase in median income between 1996 and 2005, by groups (see chart nearby). The chart shows that “the poorer an individual or household was in 1996 the greater the percentage income gain after 10 years.” For households in the first quintile, for instance, income rose by 90.5 percent between 1996 and 2005, whereas households in the second quintile only got 34.8 percent richer. Families in the top 10 percent of the scale experienced a 2.9 percent raise. A 90.5 percent increase doesn’t make you rich when you’re making so little money. Using data from Table 2, a family in the lowest quintile would have seen its earnings increase by $7,700 (90.5 percent over $8,500). For a household in the second quintile, income would have risen by $7,552. (See Chart 2.) Considering that their incomes in 2004 would have stood at $16,200 and $29,300, respectively, nobody would say that they "made it." The US is a society of extreme inequality – there isn’t much argument about this. Inequality is less of a problem, however, if people have a chance of becoming significantly wealthier regardless of how poor they are. Inequality reflects the extreme rewards to success; income mobility measures the opportunities to achieve that success. Unfortunately, my impression is that large income gains are less likely than the WSJ believes. Over the next ten-year period, I would expect most households to experience changes of plus or minus $10,000 – clearly not enough to climb the income ladder. (*) The median family is the one in the middle of the income distribution, with half of the families having higher incomes and half having lower incomes. You should also look at the fact that the Treasury study didn't take into account age. In other words, much of the move in income from first quintile to second quintile over the period in question simply reflects college students -- who are in the lowest quintile while in college -- graduating and starting careers. Similarly, the drop in the income of the fourth quintile probably reflects people reaching retirement age, at which point their income drops off. The only way to really study social mobility is to track a the quintiles of a generation, rather than simply quintiles over time. What matters is economic status among the peers of the same generation. Absolutely. I should have added that to my post. As I read your comment I started thinking that maybe excluding young and old individuals would do. That would be better than what the Treasury does, but not best: earnings still rise and fall over the life cycle, even considering people between the ages of 30 and 55, for instance. One would have to track cohorts, as you say. With PSID data, for instance, you'd have to take 5-year cohorts, for example, in order to have a homogeneous group and still a decent sample size.